October 2016 | La Petite Noob | A Toronto-Based Fashion and Lifestyle Blog. One morning, a few months ago, I opened my closet and mumbled the same thing most women have said at one point in their lives: "I have nothing to wear." The thing was, I wasn't being melodramatic - I was staring at a closet full of printed dresses and one-pieces, all of which had been exhausted and with limited options for mixing and matching. As a condo dweller in a big city, it just isn't spatially convenient to have a closet full of dresses - and that's hard for me to admit, since you guys know that I love my dresses. Lately I've been allowing trying to build up my separates and have noticed a huge improvement in the amount of wear that I'm able to get from my clothes. Take these Aritzia white culottes for example; you guys have seen them worn all summer with little tanks and crop tops, but now I'm getting so much more wear out of them by pairing them with heavy knits and booties. This sweater is a newer addition to my tiny wardrobe and already it's been working overtime, being paired with trousers, skirts and tights. Will I give up my love for dresses and all things pattered? Probably not - I really love wearing dresses. Now though, I'm going to try to be a bit more selective on which dresses make the cut and put a larger focus on separates. My tiny condo-sized closet will thank me. What do you guys think? Are you in the same boat as I am with your closet space, or are you able to have as many dresses as you want? How do you mix and match your wardrobe? Let me know! Even though we've barely hit Halloween, my mind has been on the holidays. With every date I pencil into my calendar of a holiday party or event the inevitable question pops into my head: "What am I going to wear?" 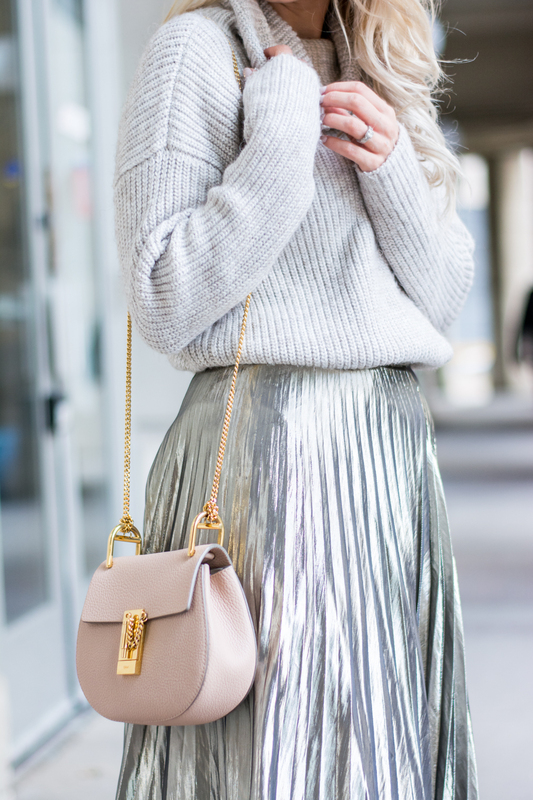 Enter this silver midi skirt. 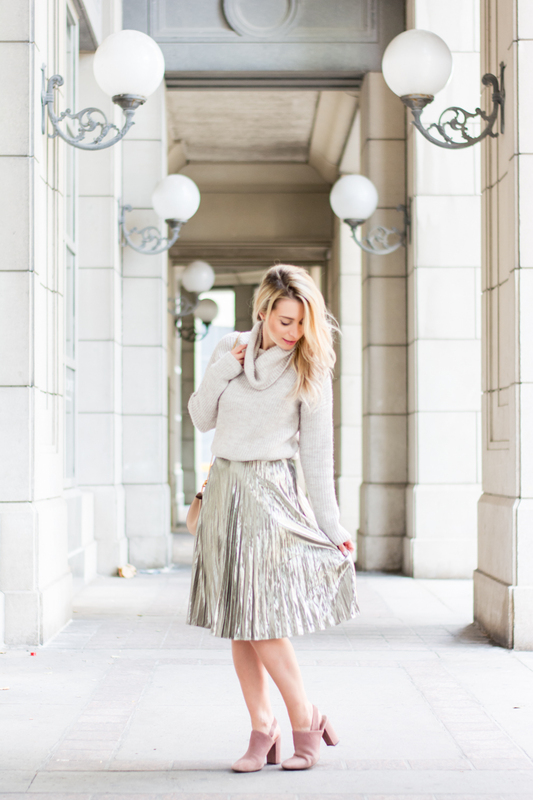 As soon as I saw the metallic pleats, I knew that it would be perfect for the holidays! Paired here with a thick sweater, this would be a great casual-party outfit; and can change easily to night by swapping the knit for a lacy camisole, a leather jacket and some pumps. I'm also trying this thing lately where I'm opting more for separates instead of just gravitating towards dresses - more about that later, but I'm really trying to create more of a well-rounded, re-mixable closet. Condo dweller problems. What do you guys think? Have you already started planning for the holidays, or is it too soon? 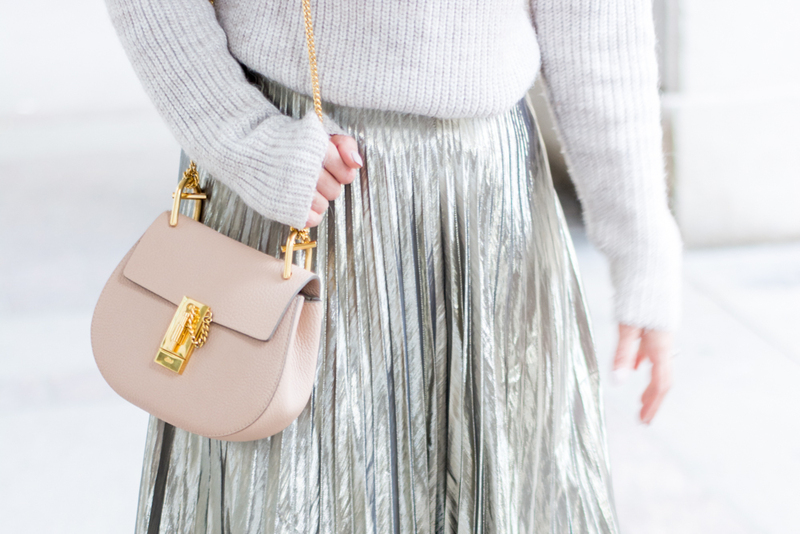 Are you into the metallics? Let me know! Pink is the name of my game lately. Whether its on my Instagram, Snapchat (username: lapetitenoob) or if you see me walking around Toronto, one thing is clear: I'm wearing a lot of pink. Topshop has been speaking my language lately and has been fuelling my addiction to the shade; so much so that on a recent shopping trip to the store I nearly bought them out of the colour! The result is this very pink, mixed-textured outfit that has got me feeling either like a grandmother or a bag of cotton candy; either way I'm not sure, but I'm definitely not hating it! Add a pair of oversized, aviator glasses and some pink mules and I'm in my new un-official uniform. Pink is the new black, and I'm in love! You guys know the my love for Hielevn bags runs deep, as I wear my blush bucket bag and white top-handle to death! My newest addition to the collection is this adorable pink shoulder bag, and I honestly haven't stopping wearing it since I got it. I love how it has almost an old school book-bag vibe and can fit so much - I'm talking my DSLR camera, everything I usually fit in my purse and a tablet! Needless to say, I'm addicted and you will be seeing this pink beauty a lot around the blog. What do you guys thing? Too much pink, or just right? What colours can you not get enough of lately? Let me know! Blush pink has become a bit of a religion for me, and I am very devout - so much so that I can barely walk by a blush item in the stores without scooping it up and sprinting to the cash register, credit card first. 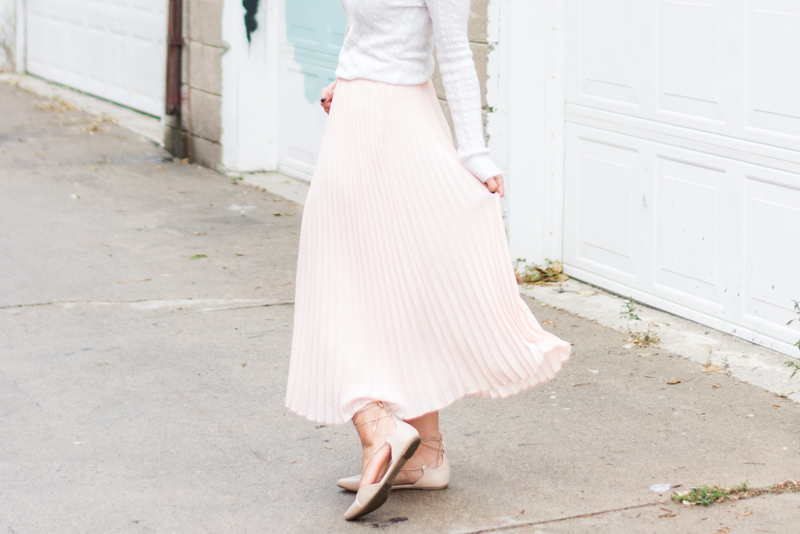 This blush pink midi skirt is a bit of a staple for me during Fall, even as the weather cools. This easy brunch look was made more autumn-appropriate with the addition of a knit sweater and come lace-up flats. Simple! What do you guys think? Is there just one colour that you can't resist? Let me know! Thanks to Gabriella of Pastels and Pastries for taking these photos! If you like something a lot buy one in every colour, right? Right?! Call me obsessed, but I've got a thing for the Topshop oversized blazers - so much so that I recently picked up another one in sky blue. I love how this colour gives any outfit an almost futuristic vibe - especially when paired with these boots! Can you have too much of a good thing? My answer is no; especially when it comes to this blazer. Boots - Public Desire, Bag - c/o Hieleven. What do you guys think? Do you stock up on an item when you love it, or is one enough? Do you like the change from my typical pink wardrobe? Let me know! 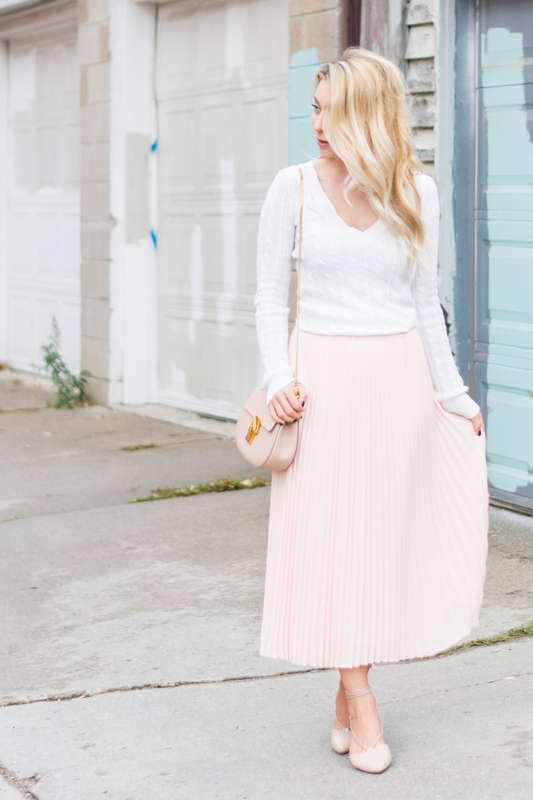 Culottes were a staple for me throughout the summer, but will they fit into my fall wardrobe? Typically with the start of a new season, I take a hard look at my closet and assess what pieces can be packed up for storage and what can be styled with the new weather. Light summer dresses and shorts were an obvious choice for storage, but my culottes gave me pause for thought. While these comfy wide pants were a staple for me throughout the summer, I will definitely use them to carry me into fall - and well into winter as well! Paired with a comfy knit sweater and closed-toe mules, these white culottes from Aritzia will definitely be a staple for autumn. Take this exact outfit and add a jacket and a pair of boots and it can work for winter. 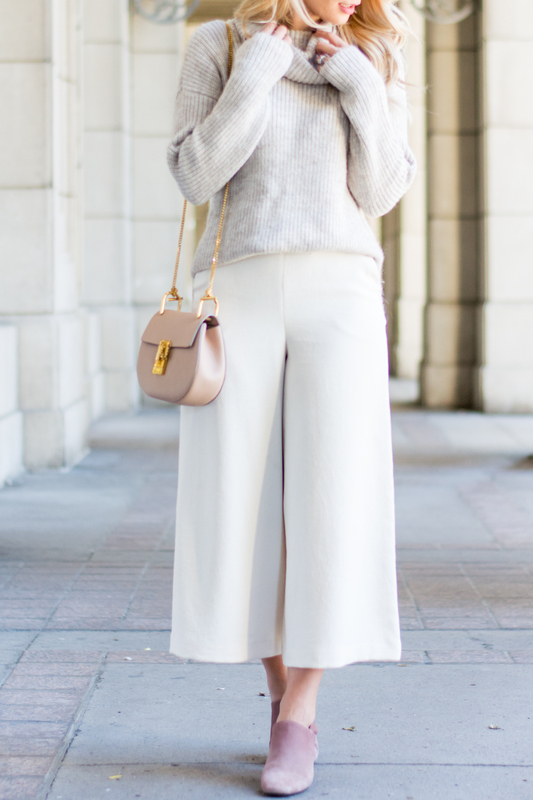 The verdict is in: culottes are here to stay! What do you guys think? What's the summer wardrobe staple that you'll be taking into fall with you? Let me know! Sometimes we have a special piece in our wardrobes that just makes us happy; my piece is this dusty pink maxi dress from COS, self-dubbed the Khaleesi dress. The flowiness of the fabric and delicate colour definitely makes you feel like you're in another, more royal world. Paired with my favourite lace-up sandals, this outfit makes me feel like a queen while still staying comfortable. What do you guys think? Do you have an outfit that makes you feel like you're in a another world? Let me know! I think that I might be stuck in a rut, clothing wise - and I'm not mad about it. If you were to take a peek into my wardrobe, you would notice that it's all pink and black. All of it. As much as it seems boring to essentially only wear two colours, I'm actually enjoying it. Not only is getting dressed in the morning so much easier, shopping is much quicker too; I can go into a store and know right away what I will like based on colour. This pink off-the-shoulder body suit definitely fit the bill, and I love how effortless it is. Paired with my new favourite stretch jeans from Old Navy, this is definitely an outfit that you would see me in on the regular. Keeping on the theme of being a creature of habit, I wanted to mention to you guys where I get all of my sunglasses. I'm a sucker for designer sunglasses, but have a hard time swallowing the prices - especially when you purchase them in-store! Since first discovering them years ago, I have without-fail gotten all of my sunglasses from SmartBuy Glasses. These Fendi Galassia glasses are the newest addition to my collection, and I love how different that they are. The grey tortoise detail and metal arms make them super interesting, and I can't wait to style them with different outfits as we approach the winter. What do you guys think? Have you fallen into a style rut before, but not been bothered by it? What colours do you typically wear? Let me know!